I recently had the opportunity to volunteer at a grief and loss camp for children. It was a very powerful experience to say the least. While I was there, I met some amazing people, including an enthusiastic high school junior. I am dedicating this blog post to her and her career question. Q: How can I figure out what I want to do as a career? A: Good question! I have provided some of my favorite career development websites below. They are all easy to use and are great for teens and counselors too! O*Net Online has information on worker characteristics, worker requirements, experience requirements, occupational requirements, workforce characteristics, occupation-specific information. O*Net Online is one of my favorite websites to use with students. O*Net Online allows users to search occupations by Holland Code, industry, job cluster, skill set, and much more. Students can also do an occupation quick search by just the name of the occupation. To show the information O*Net Online, I did a search for School Counselor. The occupation profile provides an abundance of information including: Tasks, Tools and Technology, Knowledge, Skills, Abilities, Work Activities, Work Context, Job Zone, Interests, Work Styles, Work Values, Related Occupations, Wages and Employment and Additional Information. (When you click on the links the information will be specific to the occupation "school counselor"). The Wages and Employment section of O*Net Online is linked to a website called Career One Stop, which provides salary profiles nationally and for each state. As if all of those resources are not enough, O*Net Online has a Free Interest Profiler, utilizing Holland Types, available for download! Education Planner has an abundance of resources all in one place. I recommend taking time to explore all this website has to offer. Education Planner has information about all aspects of post high school education including: Discovering, Preparing, Selecting, Applying, Deciding, and Paying! The features of Education Planner I use the most are Discovering and Preparing since I am a middle school counselor. Education Planner has a career assessment utilizing Holland Types. Education Planner has a middle school checklist detailing what students should be doing in middle school to prepare for their future career. Education Planner also has a section for counselors with more information about the website assessments and access to worksheets for students. Education Planner also offers free posters and informational brochures. Career Zone Pennsylvania is a great website for career exploration. Career Zone PA features career assessments, an occupation search, career exploration, information about budgeting money, career cluster videos, and more career resources. Do you have any favorite websites for career development or exploration? Share your favorite resources and websites below or submit them via email. This week's Fabulous Find is Bag it Forward! If you have been to any department stores lately, the secret is out. Summer is over according to the retail world, and BACK TO SCHOOL time is underway. As a counselor, I have worked with many students and families who cannot afford school supplies. As a daughter of a teacher, I have been on countless shopping trips to buy school supplies with my mother for her students. Teachers (and counselors too!) spend a lot of their own money on school supplies for their students. This week's Fabulous Find, Bag it Forward offers a great opportunity to help students and teachers by supporting Adopt-A-Classroom. Elmer's is will donate $10 for each blog post donating a "virtual bag of school supplies" and supporting this amazing campaign! Please forward this to everyone you know, especially bloggers who can post it to their blog! I am donating my "virtual bag of school supplies" to my mom, an amazing fifth grade teacher! Please see the rules below and Bag it Forward! Danielle is a K-12 Certified School Counselor, Nationally Certified Counselor, and blogger at School Counselor Blog, a blog where school counselors can share creative lesson plans, innovative ideas and quality resources. You can contact Danielle via email, follow her on twitter, and become a fan of the School Counselor Blog Facebook page. 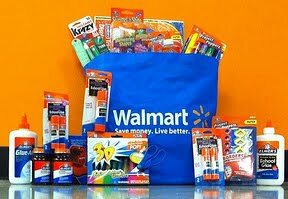 The Elmer’s Virtual Bag It Forward is charity blog meme, bloggers are able to raise $10 per blog post for Adopt-A-Classroom by writing a blog post and donating a virtual bag of school supplies . Elmer’s will donate $10 per each post written to Adopt-A-Classroom, up to $10,000. You can give as many virtual bags as you want in your post, but only one post per URL is counted towards the donation. You can post at multiple URLs. The Elmer’s Virtual Bag It Forward will officially begin at 12 AM EST on July 22, 2010 and end at 12 PM EST on August 12, 2010. Blog posts submitted to us before or after that time period will not be counted for. Link back to person who gave you a bag of school supplies.